1 of 5 Heat gas grill to medium-high or prepare charcoal grill with medium-hot coals. In a bowl, stir lime juice, cumin, chili powder, salt, cayenne. 2 of 5 Place onion rings on large plate; brush both sides with some of the lime juice mixture. Microwave on HIGH for 1 minute. Set aside. 4 of 5 Coat all vegetables with nonstick spray and grill, covered. Grill asparagus 10 minutes, turning often, and onion, 8 minutes, turning once. In a grill basket, cook single layer of peppers 10 minutes, turning often; remove. Add squash in a single layer; grill 6 minutes, turning once. Place all vegetables on a platter. 5 of 5 Heat tortillas according to package directions. 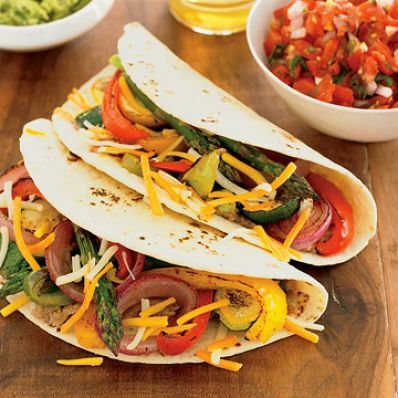 Spread each with 2 tablespoons hot refried beans, then 3/4 cup mixed grilled vegetables. Top with 1 tablespoon each cheese and guacamole and 2 tablespoons salsa. Fold in half. Repeat with remaining filling and tortillas, and serve.